Staffed by three pharmacists and two pharmacy technicians. 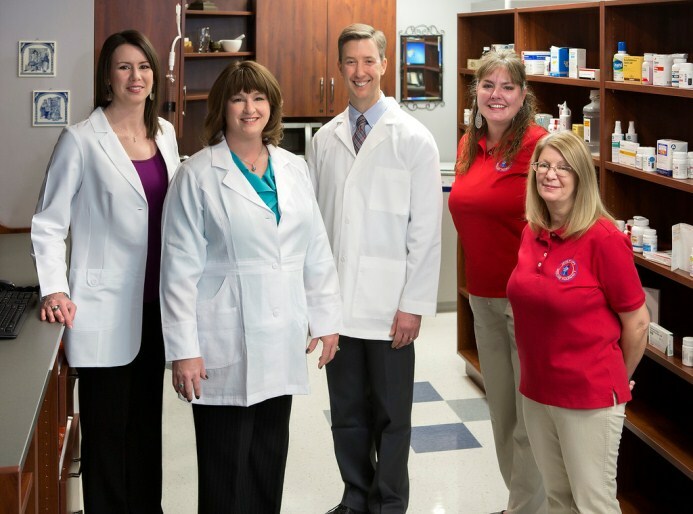 Pictured left to right, the pharmacists include Jerusha Coward, Pharm.D., Erin Claiborne, DPh., and Mark Jones, DPh. The pharmacy techs are Gina McCauley and Marilyn Guffey. Counseling for Medicare Part D prescription plans available. Pharmacists: Jerusha Coward, Pharm.D. ; Erin Claiborne, DPh. ; and Mark Jones, DPh. Open Monday through Friday, 8 a.m. to 8 p.m. and Saturday 8 a.m. to 1 p.m.